Today we’re pleased to share the new and updated LEGO IDEAS with you. For the last couple years, we’ve been on a journey to make LEGO IDEAS more than a place to share ideas for new LEGO sets. 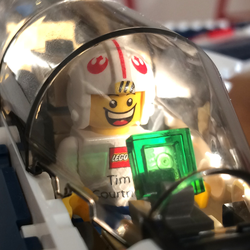 We’re working to make it the crowdsourcing and co-creation hub for teen and adult LEGO fans. This started with the LEGO IDEAS Test Lab early last year, and then the Contests beta we launched in November. Now, we’ve redesigned our site and navigation to feature Contests fully alongside the “classic” LEGO IDEAS projects—which we’re now calling Product Ideas. In September, our sister site LEGO Rebrick will close, and we'll run all the exciting future contests on IDEAS going forward! By combining Product Ideas and Contests under one platform and brand, we believe we can offer you more and better opportunities to connect with us over your LEGO ideas. A redesigned, responsive site design with an improved mobile experience. A news feed that shows you top items according to a score by default. You can also toggle the feed to show the most recent items first by selecting “New” in the Sort By box underneath the left menu on any news feed page. Read more about how Top items are sorted. Redesigned navigation menus that make Contests more visible. Projects are now called “Product Ideas.” We found the public called them “ideas” anyway, so we updated this for clarity. The Discover page now lets you search product ideas, contests, contest entries, and blog posts. Under Prizes and Rewards, we have added a missing mention of the consolation prizes given for Product Ideas not approved in Review. LEGO Rebrick will run contests over the summer, and transition to LEGO IDEAS September 1st. If you entered any LEGO Rebrick contests, you’ll want to save your data before the site goes offline. We’ll send a couple reminders as September 1st approaches. We're streamlining our crowdsourcing and co-creation experiences under one brand and platform—LEGO IDEAS. Until now, members could earn “Clutch Power” points for doing certain things on the site like earning followers or receiving likes for comments. While this was a way to rank active members, the cumulative nature meant newer members couldn’t easily break into the rankings. We prefer all members be welcome on equal footing and the focus be on great submissions. So, we’ve removed Clutch Power points. Don’t worry though, your badges aren’t going anywhere! If you’re between 13-15 years old, we now need your parents’ consent to have a LEGO IDEAS profile. Due to new data protection laws, if you’re between 13-15 years old we need your parent or guardian’s consent to allow you to continue using LEGO Ideas. If you have active Product Ideas or Contest Entries, these are de-activated until we receive their consent. Read more on our Help and FAQ. This is the first step in a series of updates this year. We’re already working on improving the look and feel of Contests, along with other design enhancements across the site. Once we improve how contests work and the admin tools that allow us to support them, we’ll remove the "beta" label. Look forward to more exciting LEGO IDEAS contests late summer and fall 2018!